NASA Kennedy Space Center’s Digital Learning Network and Speakers’ Bureau received the Women Engineering Pro-Active Network (WEPAN)/DiscoverE Girl Day Award for 2017 for their “Introduce a Girl to Engineering Day” Program. The award was announced June 13 during WEPAN’s annual Change Leader Forum in Westminster, Colorado. 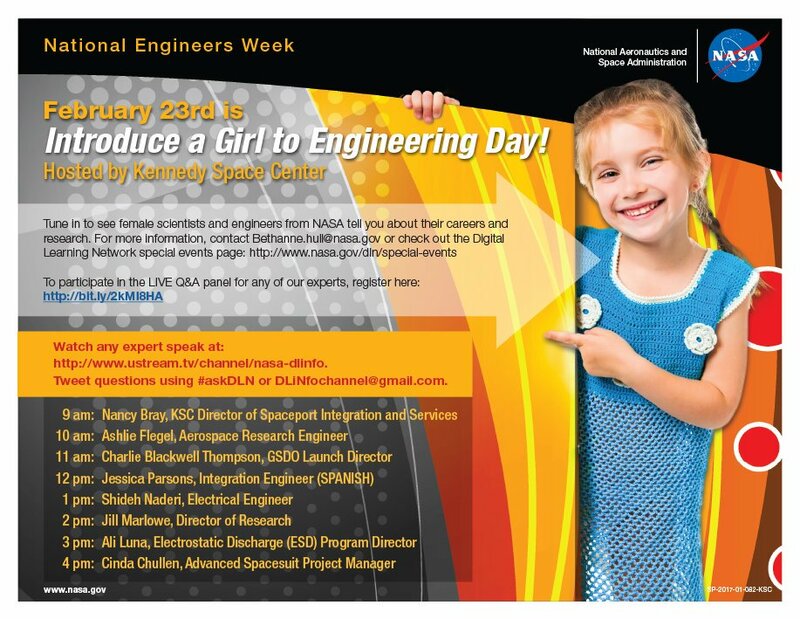 The program was viewed by more than 12,000 people on Feb. 23 during National Engineering Week. “This was the first year we hosted an ‘Introduce a Girl to Engineering Day’ event. The flexible schedule allowed groups to join in at a time that was convenient. It was a well-organized and widely attended event that provided girls with role models and information about opportunities in engineering,” Fletcher said. The program featured female NASA subject-matter experts inspiring viewers with details about their careers, the challenges and rewards. WEPAN and the DiscoverE Foundation work together to recognize organizations and individuals whose participation excelled in the “Introduce a Girl to Engineering Day” initiative.